The central point of every electrical installation is the Consumer Unit, or fusebox. 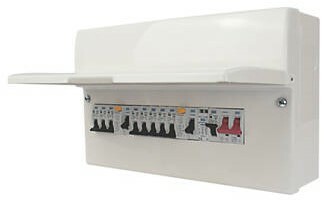 All electrical circuits in the property are connected back to this box. The fusebox contains the fuses, circuit breakers, RCDs etc which are required to protect both people and property from electric shock and fire should an electrical fault arise. Older fuseboxes like the one shown on the left used awkward rewirable fuses to protect against overloads and short circuits whereas a modern consumer unit like the one on the right will contain circuit breakers. These are generally much more sensitive than rewirable fuses and will disconnect the circuit much faster should a problem arise. A modern consumer unit will also incorporate one or more RCD's (Residual Current Device). An RCD Could Save Your Life!! Many injuries and even deaths could be prevented by having RCD protection in your home. An RCD is a device which will cut off the supply in a fraction of a second should an earth fault occur. They are present in modern consumer units as standard and can be readily identified by the built-in "TEST" button. If you are in any doubt whether there is one present in your home then we would strongly advise that you have it checked. An RCD can be fitted any time and is especially essential for the protection of socket outlets. RCD protection is now MANDATORY in all new and modified electrical installations in domestic properties. If you are at all unsure about the safety of your fusebox, please give us a call and one of our electricians would be pleased to carry out an electrical inspection and test.